Sometimes when we learn a calligraphic alphabet we learn the letters in pencil first, and that's certainly a valid option for uncial too. But because they're such chunky letters, they look rather different as a fine pencil line rather than a juicy inked line, so we're going to be brave and go straight for it with a pen. 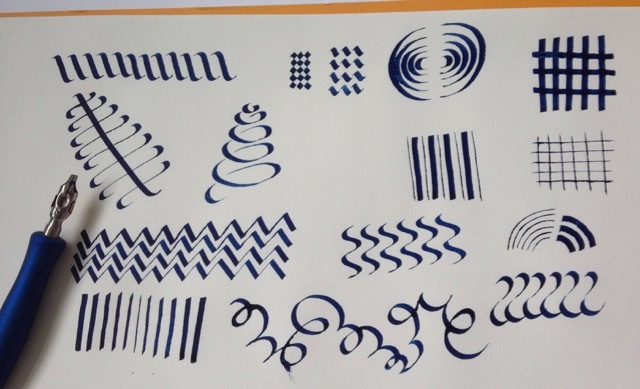 If you're new to calligraphy, you might well be saying "an edged pen.... a what?" An edged pen is one of a number of types of pen that share the same shape of nib- it's like a garden spade, wide one way, and narrow the other. ​Now I'm hoping you've an edged pen in hand and you're ready to go. It's really tempting to want to write letters right away (and of course I'm glad you're keen!) but it's incredibly valuable to just play, and make patterns - you'll learn so much more about what the edged pen will (and won't) do, and you'll start to know how to get the very best from your tool. 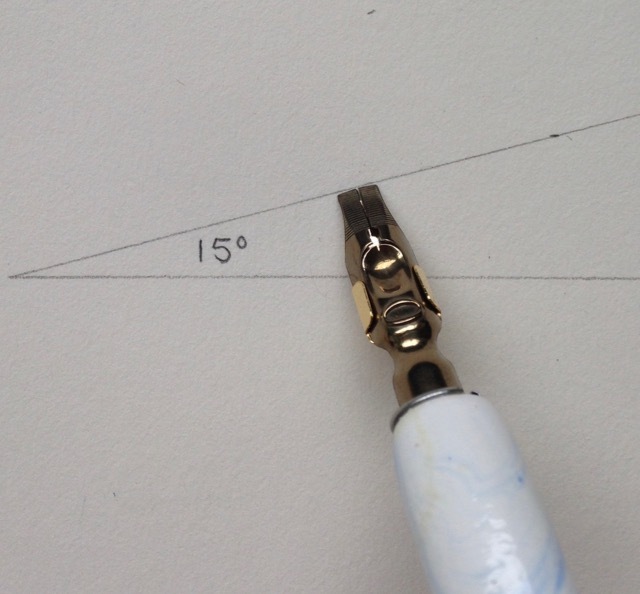 Try and keep the whole of the edge of the pen on the paper at all times - don't tip it onto one corner. Here's a sheet of playing I made - it doesn't have to be tidy and organised - more important to be adventurous and observant about what works well. 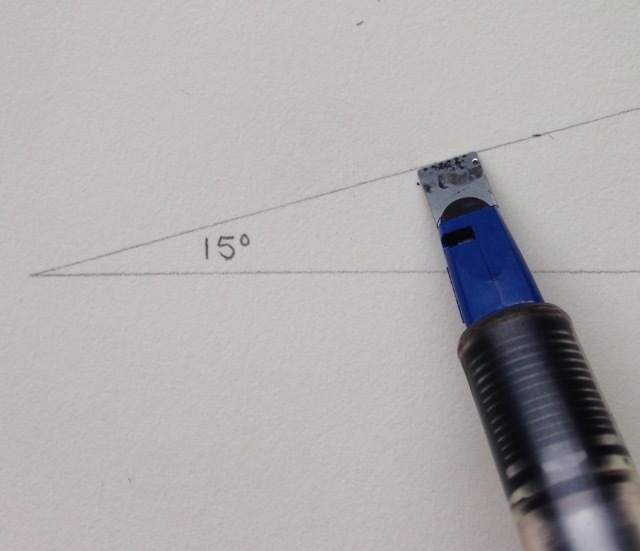 When you were playing, you will have noticed it's possible to make a really thin line with the pen (with the whole of the edge on the paper) by moving the nib so that it stays in the wet ink of the line you've already made. 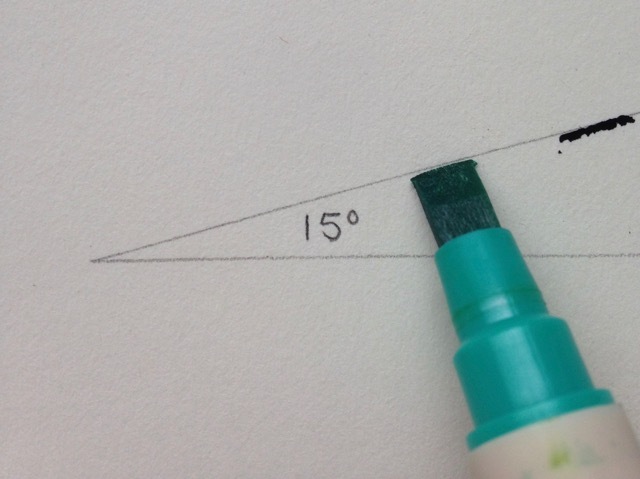 You can make thin lines in different directions by turning the pen in your hand. For uncial, that pan angle is 15 degrees. Remember that line you ruled at 15 degrees in the last lesson? It can be helpful to think about the 2 corners of your pen sitting on that line - that will you get you holding your pen at the correct angle for uncial. Take an edged pen (ideally a No1 Mitchell or No 1 Leonardt or Brause 3 or Tape 3). If you're using a Zig pen for now you're going to be using the smaller end. (Drop me a note if you're using something else, or you're feeling unsure). On a new sheet of paper and rule 2 horizontal lines, 1 cm apart. Once that plain downstroke and the i and o are feeling OK, we can add a few extra strokes to what we know, and get some more uncial letters. ​When you're ready I'd like you to write out those 9 letters twice, and also write a couple of words (or more) that are made from letters ONLY from that list we've learnt so far (e.g. JOG and PIT - but see if you can think of longer words). Take a good photo or two and send them in!